When I first watched the trailer for the French thriller 13 Tzameti I had visions of Deer Hunter going through my head. I assumed that a film filled with games of group Russian roulette would be thrilling and unbelievably suspenseful. What I found is that a film needs far more than a thrilling concept to be suspenseful. Although there were many scenes of drawn out tension, there was nothing at stake. Although the film takes its time getting to the game, there is never any focus on specific characters in the film. Much of the film seems to be inching towards action, but by the time we get there all interest has been lost, and there is no concern for any of the characters. This is the biggest problem, because the only way Russian roulette is suspenseful is if we care about one of the men that could die. Since the filmmakers never take the time to make certain we are attached to what is going on before they pull the trigger, I hardly blinked when the gun fire finally did start. 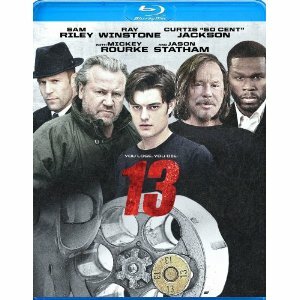 In the American adaptation of the French thriller, 13, I anticipated some changes to the style if not the storyline, though once again the film revolves around a young man (Sam Riley) who gets caught up in a deadly game of greed and survival. When he overhears about a game of some sort that will make him rich, themoney-troubled young man manages to sneak his way in. To his surprise the game is a high stakes gambling event where rich men gamble on who will die and who will live when a group of men line up and hold a gun to another man’s head. When a light bulb in the middle of the room lights up, everyone shoots and hopes that the man behind them has no bullet in the chamber. The trick about the game is that even with a bullet in the chamber, speed plays an important factor. If the man two behind you shoots before the man with the gun to your head, and they both have bullets, it is a lucky round and a close escape. Had the film been more willing to invest creativity in the game, it may have been more fun to watch, but this is obviously an art film that doesn’t want to be dumbed down by explanations. Unfortunately, as smart as the film may be, there was never enough attention given towards making it interesting. All of the elements are available, but sadly they are mostly underplayed, and the biggest change in the adaptation is the cast members. There are a lot of stars in this film, but most of the talent goes unused. Some characters even appear to be throwaway roles, such as the insignificant melodrama which occurs between Mickey Rourke and Curtis “50 Cent” Jackson in the film. In the end 13 has more star power than its predecessor, but the storyline almost seems to work better with unknown actors anyway. Having Jason Statham in a film like this almost feels like a waste. The Blu-ray includes a high definition presentation of the cutthroat film, which was also shot in color in contrast to the black-and-white original. There are no special features to speak of.